I love soup. I could eat soup in the middle of summer when its over 100 degrees here in sunny Florida. In the past few years I’ve began loving dumplings in soup. In the January/February issue of Rachael Ray Magazine they had a full 10 recipe spread of different variations of soup. They made what they called a Chicken Parmesan soup. I’m not a huge fan of Chicken Parm, but I’ll eat it if that’s my option. My husband on the other hand is the worlds biggest Chicken Parm fan–so much that we served that as one of our food choices at our wedding! I knew he would love this soup and I would love it thanks to the ricotta dumplings! Yes, these aren’t chop up refrigerated biscuit dumplings… these are homemade cheesy-goodness dumplings. Best of all the ricotta dumplings were incredibly easy to make. After some major tweaking of the recipe Italian Style Chicken & Herbed Dumpling Soup was born! Place a large pot over medium-high heat and add 2 tablespoons olive oil. Add the chicken to the pot along with 2 cups of water, 2 cups of chicken broth, onions, and garlic. Bring to a boil and cook for 10 minutes. Reduce to medium heat and cook for an additional 10-15 minutes or until chicken is tender enough to shred. Remove the chicken from the pot, and shred. Keep to the side. In the mean time add the can of stewed tomatoes (you may have to chop them a little more than what they already are in the can), 2 tablespoons fresh basil, and red pepper flakes to the pot and season with salt and pepper to taste if needed. Add the chicken back to the soup pot. Begin making the ricotta dumplings. In a large bowl mix ricotta, 1 cup parmesan, flour, and 1 tablespoon each chopped basil, parsley, and thyme. Add salt and pepper to taste and mix well until all ingredients are combined. Begin rolling dumplings into a half-dollar size ball and add to the simmering broth. Let dumplings cook 5 minutes or until puffy. 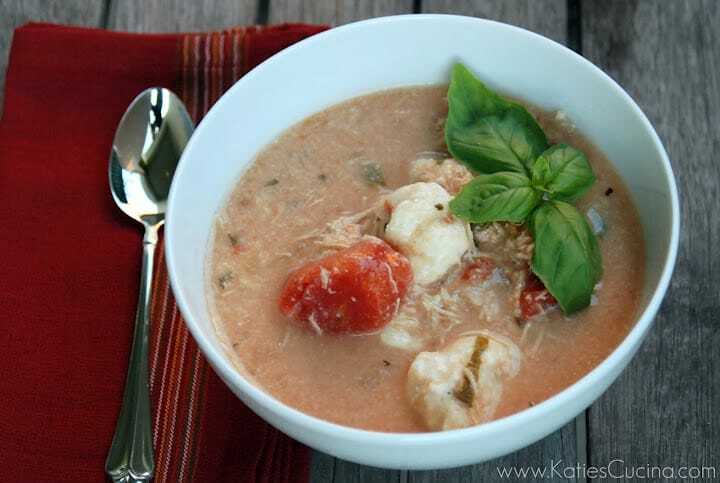 Serve the soup topped with a generous helping of Parmigiano Reggiano and more basil. This is my kind of soup. These flavors sound soooo good! Thanks for finding my blog! I’m glad you did, because I’m loving yours 🙂 This soup looks great! I’ve never made dumpling soup, so I’d probably start with the dropped-biscuits method, but this is something to aspire to! Making your own dumplings is super easy. The dropped-biscuit method isn’t bad, but these dumplings take it to a whole new level! i love soup, too, + i can eat it in the middle of the summer heat, too! this sounds awesome – i’ll definitely have to give this a try! i LOVE dumplings – these sound perfect! This looks delicious. I’m trying it. It’s 86 here in the midwest today but ‘taint gonna last. Plenty of soup real estate left, I’m afraid! Thanks!! I love soup! This looks yummy! I made a Mexican version once, love the Italian version too! I love the idea of a mexican version of chicken & dumplings soup! Must try ASAP! Wow! The dumplings are the real star of this dish. What a wonderfully flavourful and comforting dish. I love the two different cheeses and they look as light as a cloud! I am so with you on eating soup anytime! It’s one of my favorites to both eat and cook. This one looks super yummy, too. Dumplings are so comforting and really turn soup into a hearty meal. 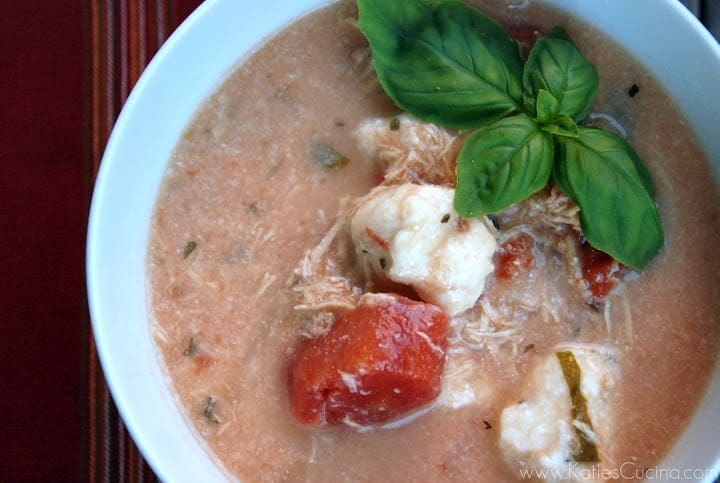 I’m a big soup fan – what a great idea adding some ricotta dumplings! Me too—I don’t think I can ever make dumplings the same ever again. I love soup too! I don’t care if it’s 105 degrees outside – I’ll put the AC on and enjoy a nice bowl of soup. That being said, we’re hitting about 80 in LA but that obviously won’t stop me from making this. Those cheesy ricotta dumplings sound so enticing! Mouth. Is. Watering. Reading. This.